The first question may be to ask, “Does Beartown refer to a place, or a state of mine?” It just may be the latter. About three decades ago, I was living a simple life. I had earned a BS in college, and had no clue what to do or where to go. The good news is, I had a banjo. It was (is… I still have it) a kinda crummy Hondo banjo with a cast aluminum pot. Sounded tinny, and the neck seemed to be made of willow. After about a 6 month jaunt on the west coast squatting with parents and family, and travelling/living in my VW camper I had returned returned to the Finger Lakes to follow my dream… to be in the wine business. Being dead broke, I secured a job in a local vineyard (actually a good place to start a career in wine) as a vineyard laborer. Jobs included “suckering”, fruit thinning, pruning, pulling brush, digging holes, and so on. It didn’t pay much, but I do look back fondly on that kinder, simpler era of my life. I was fortunate to have a place to call home for a few years at that time. It was my little piece of heaven nearby the vineyard at the end of a dead end road… you guessed it… “Beartown Road”. There was a big wood stove that could hold several large armloads of wood, and burn it all in a few hours. It sure heated the place when it was going, which was good because on a windy night the breeze would blow through the living room. I had electricity, and a phone! There was a well with a pitcher pump right in the front yard, and a sweet 3-hole outhouse: for momma, Pappas, and little one! In the summer, it was sitting on the front porch, hanging at the swimming hole down the hill, playing around the bonfire. In the winter it was hunkering down near the wood stove. Plucking on the banjo, mostly by myself. I had a strong belief that the banjo was the perfect tool to “woo” pretty ladies, which it proved to be. Beartown road is where I met my late wife, Debra. First banjo (a few years later ~1995) and captive audience. Life moved on faster that I can even remember. Married, started a career as a winemaker, became a father, started a winery/restaurant with my wife. It left little time for the banjo, other than entertaining the kids. Truly my favorite audience! After a 25 year run in the wine business, and over a dozen years owning a winery and restaurant, Debra passed away. My perspectives and roles in the wine & food biz shifted, and I spent more time playing the banjo (a Deering banjo that Debra had given my 10 years before). 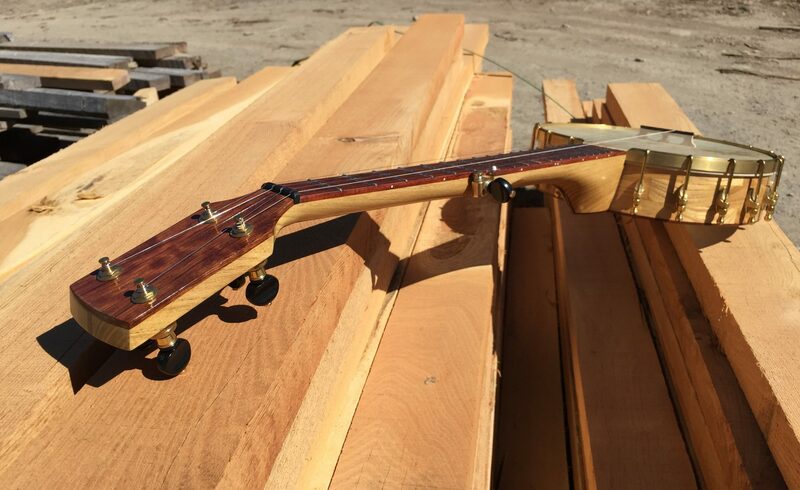 And then, I realizing the need to have more banjos… Banjos from builders Steve Selin, Colin Vance (his #001) and a sweet turn of the century unmarked banjo (maybe Rettberg & Lange). This old banjo was in pretty rough shape… so off came the finger board, which was half falling off. Twisted neck sanded close to flat, heel cut adjusted, dowel stick hole squared and shimmed, disassembled, cleaned up, etc, etc. That’s when I said to myself, “Dave, you should just build your own banjo”. So I did, and that’s a story for another day. So nice to have the background filled in on your wonderful personhood. The banjo is a wonderful companion.